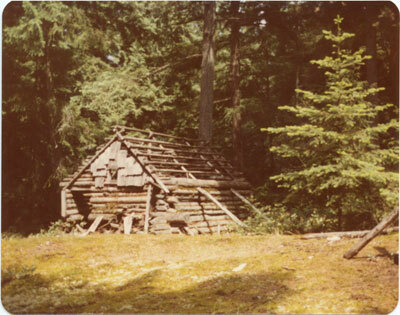 View of a run down log cabin located on Caulfeild Plateau. Cabin is missing roof shingles and is one edge of forest. Scanned December 2011 using Epson Perfection V700 Photo at 300dpi and 100% of original image size. Alternate Versions: Lossless TIF from original scan at 300dpi and 100% of original print. W11 x H9 cm colour print on photo paper.